Yesterday Team Red and Team Black took the court, together, to do battle. A number of trips to the nebulous 'out of town' area and a placid wall of e-silence left Team Red with only 5 players. Officially you are able, perhaps even encouraged, to take the court with only five players. It is not a good idea. But we few placed toe to the scrimmage to face their many. We lost. Badly. Worst loss in our history, one player suggested. Black adopted the only strategy they could: run up and down the court as many times as possible and then call in a substitute. His fresh legs run the same plan, over and over and over and over again. Twice I was mildly injured. By instinct I looked to our bench to inform a team mate that I should be taken out for a moment. No one was there. I could have been in the middle of a heated battle and losing ground, looked up hopefully toward the hill where my ally would have come only to see my last sunset. It was incredibly demoralizing. On the upside it was my highest scoring game ever. This post will be a drawn out cliche, it's conceptual entirety having been reduced to a phrase by Nike's advertising firm. Still, I feel compelled to record the thought. I like biking, both mountain and road. The hobby overflows with entertaining tasks outside of actual riding: Researching stuff, maintaining stuff, /buying/ stuff. For example today's afternoon was spent fixing my brakes. It was a very fulfilling afternoon. Then there are the numbers. Speed, average speed, heartrate, distance, cadance, air pressure, temperature, gear ratios, the list goes on endlessly. Heck, when you consider it fully, you'll start to realize that a bike is less a means of conveyance than a vehicle for useless statistics to obsess over. At the end of a ride you'll discover an intoxicating sense of accomplishment. You're bruised and cut (if mountain biking) or nursing a dull aching in inappropriate places (road) but you're finished. Chalk up a few more miles. Still, with all of that I enjoy the white serenity during a ride most. My mind ponders nothing. If you'll forgive a poor metaphor my mind forks off processes necessary to maintain speed and a path that doesn't involve children and I am left with nothing. Even while surrounded by the complicating artifacts of my admittedly simple life I don't think a thing. If one were to read my mind the emptiness would drive them to insanity. Ok, every once in a while I break into song. I'm sure there have been many versions of this for since the day google decided to make it a webservice, but I just discovered Gmap Pedometer. The next idea that I am sure exists is a digg-style site where people can bump up or down a user posted route. Then you can find good little routes to spend a day on. Slap on a forum, get some cred in the community and boom! You have a full fledged monetizable site. Though monetizing and cred are at odds with each other. 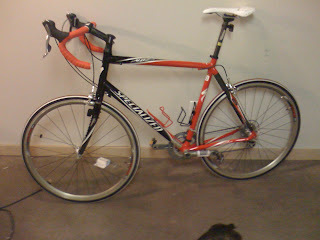 Most recently I flung a shiny new road bike over the yawning ledge of my aching emptyness. I've wanted a road bike for eons. And, as per usual, I researched them unrelentingly for months, looked at many, decided I did not need one and then immediately bought one. It was the test ride. I shied from the test ride. I averted my eyes from his penetrating gaze like a blushing bride. For I knew that should I allow myself one ride my fate would be sealed. And I was right. You don't ride road bikes. No, nothing so vulgar takes place. You and your bike have a conversation of minds. She knows your needs, you cooed them to her as she explored your mind through the door naked lust left open. You and she, in a state of one-mind, have but the single thought: Go over there. And go you will! My first couple of blocks are lost in a haze of mingled acceleration and exhilaration. The next couple of blocks left me truly afraid of what possibilities had been opened up. The remaining blocks saw a maniacal grin curl underneath tearing eyes. That was the first ride. I rode 3 in the end. The last being Dulane, the bike I had to have the store build since it wasn't on the floor. While riding I heard a sort of high pitched hum coming from the tires on the road. Like good lemon meringue pie, an insatiatable thirst for good movies or voracious readership, singing is a feature that, if found in a woman, I am immediately prepared to propose. My Bike sings to me as we go.